Tarot card games are card games played with tarot decks. The basic rules first appeared in the manuscript of Martiano da Tortona, written before 1425. The games, known as "tarot", "tarock", "tarocco" and other spellings, are known in many variations, mostly cultural and regional. The deck which English-speakers call by the French name Tarot is called Tarocco in Italian, Tarock in German and various similar words in other languages. Tarot games originated in Italy, and spread to most parts of Europe, notable exceptions being the British Isles, the Iberian peninsula, and the Balkans. They are played with decks having four ordinary suits, and one additional, longer suit of tarots, which are always trumps. They are characterised by the rule that a player who cannot follow to a trick with a card of the suit led must play a trump to the trick if possible. Tarot games may have introduced the concept of trumps to card games. More recent tarot games borrowed features from other games like bidding from Ombre and winning the last trick with the lowest trump from Trappola. Contrary to popular belief, Tarot decks did not precede decks having four suits of the same length, and they were invented not for occult but for purely gaming purposes. Only later were they used for cartomancy and divination, and also as a field for artists to display specific iconographies, often connected to some ideological system. Concrete forms appear at least since the article by Court de Gébelin in the year 1781. Italian suits are still used for games like Tarocchini. Tarocco (Italian, plural Tarocchi), and similar names in other languages, is a specific form of playing card deck used for different trick-taking games. An earlier name of the game Trionfi is first recorded in the diary of Giusto Giusti in September 1440 (in other early documents also ludus triumphorum or similar ). The name Tarochi was first used in Ferrara June 1505, the name Taraux appeared in Avignon in December of the same year. The names Tarocco, Tarocchi and Tarot developed in later times beside different writing forms. The poet Francesco Berni still mocked on this word in his Capitolo del Gioco della Primiera written in 1526. The name Trionfi developed later as a general term for trick-taking games (Triomphe in French, Trumpfen in German and Trump in English), although it has almost completely disappeared in its original function as deck name. Other different games claimed the name without any use of Tarocchi cards. The first basic rules for the game of Tarocco appear in the manuscript of Martiano da Tortona, the next are known from the year 1637. Excluding Piedmontese tarocchi, which is more closely related to French tarot, Italian tarocchi have trumps other than the I and XXI that are worth more than one card point. Winning the final trick (ultimo) awards a set number of points. Sicilian tarocchi is played in only four towns with 63 cards from the Tarocco Siciliano deck. Tarocchini is confined to Bologna and uses the 62 card Tarocco Bolognese deck. These games have four face cards in each suit but dropped some of their pip cards early in their history. Both decks include 21 trumps and The Fool, a suitless card that excuses the player from following suit. The French adopted tarot games after their occupation of Milan in the late 15th century. French Tarot, known locally as Jeu de Tarot, is one which uses the full 78-card Tarot deck. Originally played with the Italian-suited Tarot de Marseille, the game is now played with the French-suited Tarot Nouveau. The Tarot Nouveau, of Frankfurt origin, has trumps which depict scenes of traditional social activities; this differs from the Renaissance allegorical motifs found in Italian-suited Tarot decks such as the Tarot de Marseille, Tarocco Piemontese, the Tarocco Bolognese, or even the Rider-Waite well known in cartomancy. Jeu de Tarot is now the most popular card game in France after Belote and many tournaments are held by the Fédération Française de Tarot. A Tarot Nouveau deck consists of 56 cards of four suits and 22 emblematic cards called atouts (trumps). Each suit consists of fourteen cards: ten pip cards, and four face cards: the Roi (King), Dame (Queen), Cavalier (Knight), and Valet (Jack). Of the atouts, 21 are numbered from 1 to 21, and a non-numbered card called "Fou" ("Fool", also called "Mat" or "L'Excuse" in play) which "excuses" the player from following suit. Of the atouts, only the Fool and trumps 1 and 21 are considered to be "counting" cards because they are worth more than 1 point. Winning the last trick awards bonuses only if it is won with the lowest trump. Tarot games from Piedmont, the Italian region bordering France, are more similar to French tarot than other Italian games as it was the French that (re-)introduced tarot to that region. These games use the 78-card Tarocco Piemontese deck which was derived from the Tarot de Marseille. 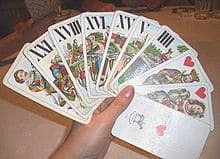 The most common Piedmontese tarot games are Scarto, Mitigati, Chiamare il Re, and Partita which can be found in Pinerolo and Turin. Piedmontese games are also the simplest tarot games and can be used to introduce new players on basic rules and features. Troccas, a Swiss tarot game, is also related and is played with the 78-card Swiss 1JJ Tarot, another derivative of the Tarot de Marseille. Danish Grosstarok, which focuses on winning the final trick, also uses the Tarot Nouveau. Tarock differs from other forms in the function of the Fool which is now simply the highest trump. Games of this category include Cego, Zwanzigerrufen and Königrufen. These games use the 54 card French suited Cego or Industrie und Glück decks that strip certain pip cards. The games are widely played in Germany and the countries within the boundaries of the former Austro-Hungarian Monarchy, for which even the name Tarockanien has been coined: the Austrian variation of the game (and the variations thereof) is thus still widely popular among all classes and generations in Slovenia and Croatia, while in Hungary different rules are applied. The Swiss game of Troggu is believed to be an intermediary form linking the older tarot games to the Central European ones. A few games use the German suited 36 card deck that lacks any dedicated trump suit. Instead, one of the existing suits, customarily the heart suit, is chosen as the trump suit. These include Württembergischer Tarock, Bavarian tarock, Brixentaler Bauerntarock, and Dobbm. They are Ace-Ten games that incorporate rules from Tapp-Tarock. A complete Tarot deck such as one for French Tarot contains the full 78-card complement and can be used to play any game in the family with the exception of Minchiate, an extinct game that used 97 cards. Austrian-Hungarian Tarock and Italian Tarocco decks, however, are a smaller subset (of 63, 54, 40, or even 36 cards) suitable only for games of a particular region. Regional tarot decks commonly feature culture-specific suits; the German suits of Hearts, Bells, Acorns and Leaves are used through most of Germanic Europe, the Latin suits of Cups, Coins, Clubs, and Swords are common in Italy and Spain, and the French suits familiar to most English speakers are seen in France, Quebec, West Germany and most of the English-speaking world. This trend continues even to non-Tarot decks such as for the German game of Skat (played with a deck of similar-value cards as in the French piquet deck used for Belote; players in most of western Germany use French suits while players in Bavaria and eastern Germany use German suits). Austrian-style 40-card Tarock hand: the Skys (Fool) as highest trump, trump 21 (the second highest), five other trumps, King, Queen, 1 ♥. 14 cards each in four suits (French or Latin depending on the region): "pip" cards numbered one (but called Ace) through ten; plus four court cards, a Jack (or Knave or Valet), a Knight (or Cavalier), a Queen, and a King. The 21 tarots, (known in non-gaming divinatory tarot as the Major Arcana), function in the game as a permanent suit of trumps. The Fool, also known as the Excuse, is an unnumbered card that excuses the player from following suit or playing a trump in some variations, and that acts as the strongest trump in others. Due to the antiquity of tarot games, the cards are ordered in an archaic ranking. In the plain suits, Kings are always high. With the exception of modern French tarot and Sicilian tarocchi, the ranking in the Latin round suits (cups and coins) or the French red suits (diamonds and hearts) goes from King (high), Queen, Cavalier, Jack, 1, 2, 3 ... 10 (low). Play is typically counter-clockwise; the player to the right of the dealer plays to the first trick. Players must follow suit if they have a card of the suit led, otherwise they must play a trump if possible. The winner of each trick leads to the next. The cards are usually counted in groups of two or three depending on the game. After the hand has been played, a score is taken based on the point values of the cards in the tricks each player has managed to capture. For the purpose of the rules, the numbering of the trumps are the only thing that matters. The symbolic tarot images customary in non-gaming divinatory tarots have no effect in the game itself. The design traditions of these decks subsequently evolved independently and they often bear only numbers and whimsical scenes arbitrarily chosen by the engraver. 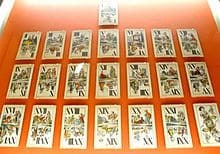 However, there are still traditional sequences of images in which the common lineage is visible; e.g. the moon that is commonly visible at the bottom left corner of the trump card 21 stems from confusion of the German word Mond, meaning Moon, with Italian mondo and French monde, meaning "world", the usual symbol associated with the trump card 21 on Italian suited tarots and in non-gaming divinatory tarot.